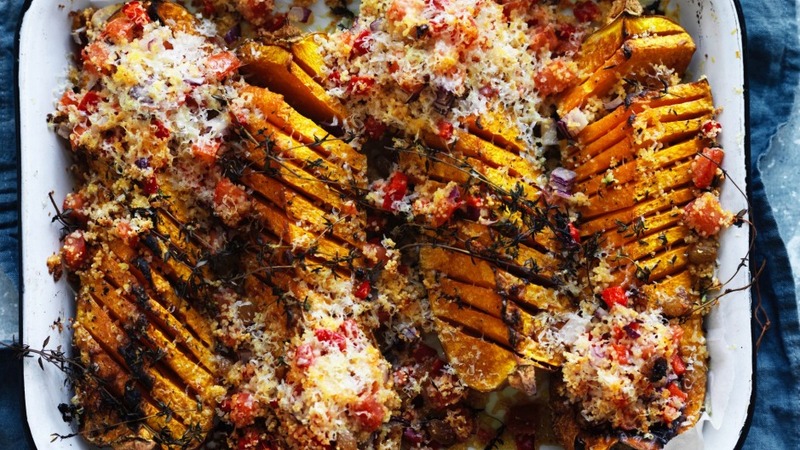 Give pumpkin the hasselback treatment. 1. Preheat the oven to 200C. Halve and quarter the pumpkin lengthways, scoop out and discard the seeds and fibrous insides. Slice diagonal patterns across the four pumpkin pieces, as you would with hasselback potatoes – slicing almost to the skin but not all the way through. 2. Place the pumpkin pieces snugly together in a small baking dish, drizzle with the oil, season, arrange thyme sprigs on top and roast for 45 minutes. 3. Meanwhile, place the cous cous and sultanas in a large bowl and pour over the boiling water or stock. Cover the bowl with cling film and set aside for 5 minutes, or until the water is absorbed, then fluff the cous cous with a fork. Mix through the red capsicum, onion and tomatoes and season. 4. Once the pumpkin pieces are tender and a knife slides into them easily, remove from the oven and cover with cous cous. Scatter with the parmesan and parsley leaves and return to the oven for a further 10 minutes. Tip: You can also use four small pumpkins, simply half them widthways before slicing diagonally. Stuff the centres with the cous cous, rather than scattering it on top. If you like this recipe, try this jacket sweet potato with chorizo cous cous.